Tim McCarthy is preparing a new book, with code examples (great!) in .NET, implementing the Domain-Driven Design ideas, from Evans et al. The book is for Wrox Press, in the Problem-Design-Solution series; the title will be “”.NET Domain-Driven Design with C#: Problem-Design-Solution”. It’s great news. We need more implementation examples of DDD ideas. Although DDD has a wide choice of implementations (at high level and details), it will be important the existence of source code and reference implementacion, to the adoption of this kind of solutions. This entry was posted in .NET, Books, Domain-Driven Design on March 3, 2007 by ajlopez. This entry was posted in .NET, ASP.NET, Books, Java, Software Development on January 14, 2007 by ajlopez. One of the mos interesting question on software development, is: Why is so hard? In my opinion, the creation of software is one of the most challenging human activities. One of the causes, is the different levels of abstractions that are needed. In a software project, you must master the big view, and pay attention to every detail. The author is Scott Rosenberg, one of the cofounder of Salon.com. 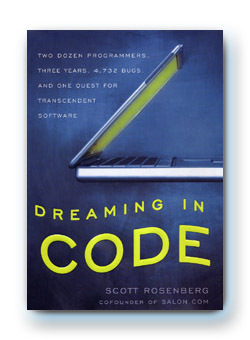 I don’t read the book yet, but it was comment by Joel Spolsky at his post Dreaming in code. According to Joel, Scott is an excellent writer, that knows how to understand the software development. The book is about the story of one software project — Mitch Kapor’s Chandler, an ambitious, open-source effort to rethink the world of e-mail and scheduling, according to the book website. Chandler, a PIM (Personal Information Manager), that Wired pointed years ago as “the Outlook killer”, is still under development. This entry was posted in Books, Software Development on January 4, 2007 by ajlopez.